Kim, S., J. Van Zyl, R. S. Dunbar, E. G. Njoku, J. T. Johnson, M. Moghaddam, and L. Tsang. 2016. SMAP L2 Radar Half-Orbit 3 km EASE-Grid Soil Moisture, Version 3. [Indicate subset used]. Boulder, Colorado USA. NASA National Snow and Ice Data Center Distributed Active Archive Center. doi: https://doi.org/10.5067/J8SGO1E0Y9XZ. [Date Accessed]. Surface soil moisture (0-5 cm) in cm3/cm3 derived from sigma nought measurements is output on a fixed 3 km EASE-Grid 2.0. Data are in HDF5 format. For software and more information, including an HDF5 tutorial, visit the HDF Group's HDF5 Web site. For a complete list of file contents for the SMAP Level-2 radar soil moisture product, refer to the Data Fields page. All data element arrays are one-dimensional with a size N, where N is the number of valid cells from the radar swath that appear on the grid. Includes all ancillary data, such as surface temperature and vegetation water content. Includes all radar data, such as cross-polarized sigma0 (sigma nought; also σ0) data. Includes soil moisture data and quality assessment flags. Each half-orbit file is approximately 59 MB. The daily data volume is approximately 1.5 GB. Figure 2 shows the spatial coverage of the SMAP L-Band Radar for one descending half orbit, which comprises one file of this data set. Figure 2. 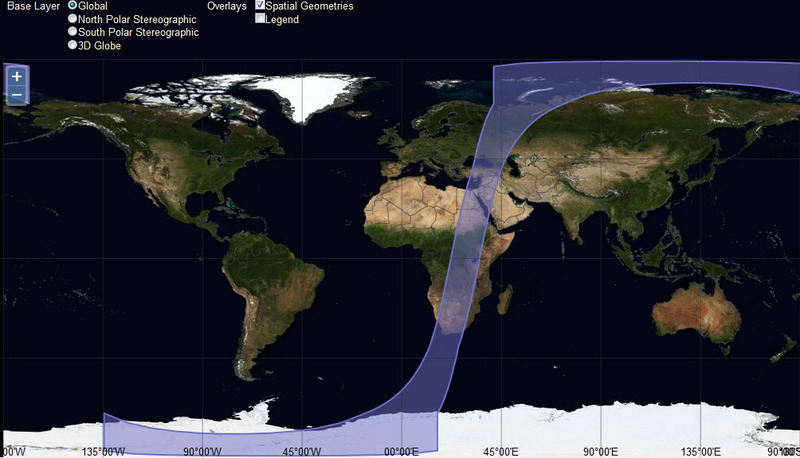 Spatial Coverage Map displaying one descending half orbit of the SMAP L-Band Radar. The native spatial resolution of the radar footprint is 1 km. Data are then gridded using the 3 km EASE-Grid 2.0 projection. These data are provided on the global cylindrical EASE-Grid 2.0 (Brodzik et al. 2012). 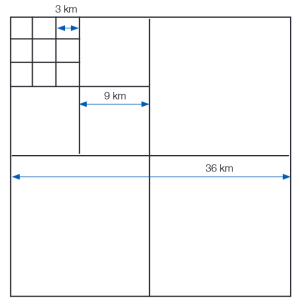 Each grid cell has a nominal area of approximately 3 x 3 km2 regardless of longitude and latitude. Coverage spans from 13 April 2015 to 07 July 2015. Retrieval of soil moisture from measured backscatter data typically implies an inversion of the radar forward scattering process. Bare rough surfaces can be characterized in terms of their Root Mean Square (RMS) roughness height, correlation length, and moisture content (a surrogate for dielectric constant). The use of time-series data makes the retrieval a well-constrained estimation problem, under the assumption of a time invariant surface roughness. By taking a co-polarized ratio the soil moisture retrieval becomes insensitive to the correlation length except for very rough surfaces, which enables an accurate retrieval of soil moisture without correlation length information. This approach has been extended to the vegetated surface by introducing a vegetation axis to a lookup table (Kim et al. 2014). A one-axis representation of the vegetation effect is clearly a simplification, considering that different sets of vegetation parameters result in different backscattering coefficients. However, with SMAP’s three measurement channels—HH, VV, and HV—at most three independent parameters can be uniquely estimated, and therefore simplified forward models must be represented in terms of at most three dominant parameters. The simplification results in some errors in soil moisture retrieval, especially in heavily vegetated areas such as forests. Allometric relationships reduce the number of unknowns and may improve the retrievals. The three parameters used to simplify the scattering model are then the dielectric constant of soil, ε, soil surface roughness, s, and VWC. The SMAP radar HV-channel measurements are reserved for possible use in correcting vegetation effects. The remaining two co-polarized (co-pol) measurements (HH and VV) are not always sufficient to determine s and ε (Kim et al. 2014). One of the main causes is the ambiguity in bare surface scattering: a wet and smooth surface may have the same backscatter as a dry and moderately rough surface. Very often the timescale of the change in s is longer than that of ε (Jackson et al. 1997). Then s may be constrained to be a constant in time, thus resolving the ambiguity (Kim et al. 2014). The SMAP baseline approach (Kim et al. 2012; Kim et al. 2014) is a multichannel retrieval algorithm that searches for a soil moisture solution such that the difference between modeled and observed backscatter is minimized in the least squares sense. A look-up table representation, or data cube, of a complicated forward model has been demonstrated to be an accurate and fast tool for retrieval (Kim et al. 2012; Kim et al. 2014). The algorithm estimates s first and then retrieves εr using the estimated s. Vegetation effects are included by selecting the sigma0 of the forward model at the VWC level given by an ancillary source. Note that the VWC provided by ancillary information is allowed to vary throughout the time series. For in-depth information regarding the physics involved in deriving soil moisture from backscatter, refer to the ATBD for this product, Section 2: Physics of the Scattering Problem (Kim et al. 2014). SMAP Level-2 radar soil moisture data (SPL2SMA) are derived from SMAP High-Resolution Radar Sigma Nought, Version 3 (SPL1CS0) data. SMAP Level-2 active soil moisture data are derived from SMAP High-Resolution Radar Sigma Nought, Version 3 (SPL1CS0) data. Utilizing the soil moisture algorithms discussed below, SMAP sigma0 measurements are converted into an estimate of the surface soil moisture of the 0-5 cm surface soil moisture in units of cm3/cm3 . The following information has been adapted from Kim et al. 2014 and Kim et al. 2015. The baseline retrieval algorithm inverts a forward scattering model. The equation for forward scattering (Eq. 2-1 in Kim et al. 2015) presents four unknowns: RMS height (s), dielectric constant (ε), correlation length (l), and vegetation water content (VWC). It will be shown that mv retrievals are insensitive to errors in knowledge of the correlation length over a wide range of m v, roughness, and correlation lengths (Appendix 5.2) (Kim et al. 2012b). An exponential function is known to describe empirical measurements well (Mattia et al. 1997; Shi et al. 1997), which was used in the forward model and was not considered as an unknown during the retrieval. As an introduction to the discussion of the retrieval algorithm, and to place the discussion of each algorithm component in the proper context, the overall algorithm processing flow is described in the following section. Each portion of the algorithm flow, and the details of the retrieval methods and options, will then be described in detail in the subsequent sections. The algorithm flow of the SPL2SMA is presented in Figure 11 of Kim et al. 2015. The portion of the flowchart through the land surface classification is the initial processing done as a precursor to the actual retrievals. The SPL2SMA processor reads in 1 km resolution sigma0 from the SMAP Level-1C sigma nought product. The 1 km data in natural unit are aggregated onto the 3 km EASE-Grid, during which various quality flags are applied. Three quality flags are derived using the 3 km sigma0 freeze-thaw state (refer to the SPL3FTA ATBD, Kim et al. 2014), radar vegetation index (Section 3.4.2 of the SPL3FTA ATBD, Kim et al. 2014), and transient water body (Section 3.4.3 of the SPL3FTA ATBD, Kim et al. 2014). Static and dynamic ancillary data are sampled for each pixel of the SPL2SMA product. Sigma0 values from the past time are sampled and used by the time-series algorithm. For each 3 km pixel, land cover class information is obtained from the mostly annual ancillary data. The land cover information allows to choose an appropriate data cube for each pixel. The retrieval over the different land cover classes is spatially assembled to create a half-orbit output, followed by the conversion from the dielectric constant to soil moisture. The SMAP radar provides three independent channels (HH, VV, and HV). HV-channel measurements are reserved for possible use in correcting vegetation effects. The remaining two co-pol measurements (HH and VV) are not always sufficient to determine s and ε (see Section 3.2.4 in Kim et al. 2015) (Kim et al. 2012b). One of the main causes is the ambiguity in bare surface scattering: a wet and smooth surface may have the same backscatter as a dry and moderately rough surface has. Very often the time-scale of the change in s is longer than that of ε (Jackson et al. 1997). Then s may be constrained to be a constant in time, thus resolving the ambiguity (Kim et al. 2012b). The concept of ε time-invariant s has also been utilized in other studies (Joseph et al. 2008; Mattia et al. 2009; Verhoest et al. 2007). The SMAP baseline algorithm differs from these studies in that no ancillary or ground measurements or statistical assumptions are required to constrain s.
The SMAP baseline approach (Kim et al. 2012a ; Kim et al. 2012b) is a multichannel retrieval algorithm that searches for a soil moisture solution such that the difference between computed and observed backscatter is minimized in the least squares sense. The algorithm estimates s first and then retrieves εr using the estimated s. Vegetation effects are included by selecting the forward model's sigma0 at the VWC level given by an ancillary source or the SMAP HV measurements. The algorithm retrieves s and real part of dielectric constant (εr) using a time series of N co-pol backscatter measurements: σ0 HH ( t1), σ0 VV (t1), σ0 HH (t2), σ0 VV (t2),..., σ0 HH (t N), and σ0 VV (tN). There are thus 2 N independent input observations and N+1 unknowns consisting of N εr values and one s value. Note that the VWC provided by ancillary information is allowed to be varying throughout the time series. Radar backscattering coefficients before conversion to decibels can be modeled as Gaussian random variables (Ulaby et al. 1986) to account for speckle and thermal noise effects. Assuming sufficient integration following power detection, the backscattering coefficient after conversion to decibels can also be modeled as a Gaussian random variable. Because SMAP will observe HH and VV returns at slightly different center frequencies, the effects of speckle and thermal noise on these measurements are statistically independent. Statistical independence of speckle in measurements at differing time steps is also expected. These facts and a maximum likelihood formulation motivate least-squares retrieval approaches based on the average of individual error terms. It is noted that calibration, radio frequency interference, and other error sources may produce correlated error terms. The systematic and correlated components from these sources will be corrected. Any residual s may impact overall algorithm performance and are modeled as uncorrelated Gaussian noise in the ATBD for this product (although they may still contain correlated noise). Additional details are provided in the ATBD (Kim et al. 2014). When the number of time-series input is set to 1, the time-series method becomes a conventional snapshot approach. εr and s are adjusted simultaneously at each time instance so as to minimize the distance between the data cube prediction and the observation. The snapshot retrieval algorithm was also tested with the two sets of field campaign data used in Section 3.2.3 of the ATBD (Kim et al. 2015). Figure 14a in the ATBD (Kim et al. 2015) shows that the bare surface retrieval has an RMSE of 0.055 cm3/cm3, which is larger than the error of the time-series retrieval. Closer examination however indicates that the retrieval e rror increases for larger soil moisture. When the performance of the Monte Carlo simulation of the Kp effect is compared between time-series (Figure 12a of the ATBD) and snapshot (Figure 12c of the ATBD) retrievals, the performance difference is much greater than the in situ validation shows (Kim et al. 2015). The radar measurement error of the in situ data (~0.3 dB) is smaller than simulated by the Monte Carlo analysis, which may explain why the Monte Carlo analysis of the snapshot retrieval show the poorer performance. The snapshot retrieval over the pasture surface is poor. Figure 14b in the ATBD (Kim et al. 2015) shows a retrieval error of 0.105 cm3/cm3. It is possible that the structure of the grass was important in characterizing the backscatter to be very different from that of the bare surface. The possibility is supported also by the large retrieval error (not shown) when the retrieval was performed using the bare surface data cube (NMM3D) after treating the grass surface as if it is a bare surface. The evaluation results suggest the limited applicability of the snapshot retrieval, and highlights the need for time-series retrievals. These two coefficients for each pixel will be determined using the expected minimum and maximum values for soil moisture and the time-series backscattering cross section data. Accommodating different vegetation phenology during the implementation of the above relationship remains as a task. The obvious assumption contained in Equation 1 is that there is a linear relationship between the radar cross-sections and the soil moisture. However, simulated data suggests that this relationship may be nonlinear. Ground radar and airborne data will be used to derive the final expression for the function f(σhh, σvv). The slowly varying backscattering cross section component due to the biomass variation will be estimated and compensated using the cross-polarization backscattering cross section. Ground radar measurements will help derive the expres sion before the SMAP instrument is launched. However, since the g round measurements are limited, with simulated data various vegetation environments will be considered. When the two extreme conditions (completely dry and wet) of the soil moisture and radar backscatter are known exactly, a test with a corn field experiment shows that the soil moisture may be retrieved with an error of 0.026 cm3/cm3 (Table 3 of Kim and van Zyl). When the errors in the two extreme values are simulated with the random noise, the retrieval error reaches 0.05 cm3/cm3. Alternatively, Kim and van Zyl proposed that C1 at each radar pixel (e.g., at 3 km resolution) is inverted using the mv retrieved at a coarse scale (such as at 36 km resolution) using the radiometer records. The radar-radiometer method is the subject of the ATBD for the SPL2SMAP and SPL3SMAP products (Kim et al. 2015). Additional details are provided in the ATBD (Kim et al. 2014, Kim et al. 2015). Table 2 lists the required input data sets to the radar-only soil moisture inversion. These include the primary choices that meet the ancillary data requirements. Ancillary data sets are defined as external data sets that are required as inputs to SMAP retrieval algorithms in the generation of the standard Level-2 and Level-3 active products. Ancillary data needed by the SMAP mission fall into two categories: static ancillary data, which do not change during the mission, and dynamic ancillary data, which require periodic updates in timeframes ranging from seasonally to daily. Static data include parameters such as permanent masks (land/water/forest/urban/mountain), the grid cell average elevation and slope derived from a Digital Elevation Model (DEM), permanent open water fraction, and soils information (primarily sand and clay fraction). All static ancillary data are resampled to the 3 km EASE-Grid 2.0 as the output products. The dynamic ancillary data include land cover, precipitation, and effective soil temperatures. The choice of which ancillary data set to use for a particular SMAP product is based on a number of factors, including its availability and ease of use, and its inherent error and resulting impact on the overall soil moisture or freeze/thaw retrieval accuracy. Latency, spatial resolution, temporal resolution, and global coverage are also important. The choice of a primary source for each of the ancillary data parameters is fully documented in individual SMAP Ancillary Data Reports (refer to Section 6.1 in the ATBD, Kim et al. 2015). Brief descriptions are provided below for the input radar backscatter, and for the ancillary parameters generated by the SPL2SMA processor. As previously stated, the primary input to the SPL2SMA algorithm is the Level-1C gridded radar product. This product consists of the calibrated high-resolution (SAR-mode) multiple polarization radar backscatter measurements and associated parameters, Earth-located and mapped to a swath-based, along-track/cross-track, 1 km EASE-Grid 2.0. It is assumed that the backscatter measurements have been fully calibrated and corrected for atmospheric attenuation and ionospheric effects such as Faraday rotation. Information provided in the Level-1C data set or in ancillary calibration files should enable estimates of the sigma nought (σ0) accuracy (Kp) for each measurement based on instrument characteristics. The SPL2SMA algorithm requires information on the VWC. One potential source of vegetation information is a polarimetric parameter derived from SMAP data such as the Radar Vegetation Index (RVI) (Kim and van Zyl 2000). Alternatively, the vegetation amount may be derived based on low-order polynomial of the NDVI and optical remote-sensing images (refer to the SPL2SMP ATBD). In principle the RVI or any other parameter based on the radar backscatter should correlate with the vegetation amount more strongly than the optical NDVI, because fundamentally optical radiation cannot penetrate vegetation canopies while the L-band microwave signal can. Furthermore the RVI is concurrent with the radar observation. Studies are ongoing with regard to whether the radar backscatter may improve estimates of vegetation effects. The Data Fields Ancillary Data group contains VWC derived from both RVI and NDVI. An algorithm for discriminating transient water bodies from land surfaces is also part of the SPL2SMA processor. There are many combinations of water surfaces adjoined by land surfaces, (depending on both land and water surface roughness and presence of vegetation) that affect this discrimination capability. At present, the case of a calm water surface next to lightly vegetated land was studied. It was found that a threshold (3 dB) applied to the ratio of HH to VV effectively separated water from land at SMAP's 40 deg incidence angle. In this study, Uninhabited Aerial Vehicle Synthetic Aperture Radar (UAVSAR) images were analyzed over fairly flat terrain. Despite the apparent differences between UAVSAR and SMAP, the measurement quality for both instruments is determined by the same statistical processes inherent in SAR imaging. Calibration error and the number of single looks of one UAVSAR pixel are similar to those of one pixel of the SMAP SAR.The algorithm was tested over numerous locations with a detection error of smaller than 10% (Kim et al. 2014). This data set is generated by the SMAP Science Data Processing System (SDS) at the Jet Propulsion Laboratory (JPL) in Pasadena, California USA. To generate this data set, the processing software ingests only the 6:00 a.m. descending half-orbit files of the SMAP High-Resolution Radar Sigma Nought, Version 3 (SPL1CS0) data set. The SPL1CS0 data set contains swath-gridded radar backscatter observations acquired by the radar and processed using synthetic-aperture processing providing measurements at 1 km resolution. After the 1 km sigma0 data are gridded on the 3 km EASE-Grid 2.0, the gridded data are then tested for retrievability criteria according to input data quality, ancillary data availability, and land cover conditions. These criteria are tested by applying various quality flags. Two quality flags are derived using the 3 km sigma0: radar vegetation index and radar water body. Static and dynamic ancillary data are sampled for each pixel of the SPL2SMA product. Sigma0 values from the past are sampled and used by the time-series algorithm. For each 3 km pixel, land cover class information is obtained from the mostly annual ancillary data. The land cover information allows one to choose an appropriate data cube for each pixel. The retrieval over the different land cover classes is spatially assembled to create a half-orbit output, followed by the conversion from the dielectric constant to soil moisture. When retrievability criteria are met, the software invokes the baseline retrieval algorithm to generate soil moisture retrieval. Only cells that are covered by the actual swath for a given projection are written in the product. For more information on each portion of the algorithm processing flow, and the details of the retrieval methods and options, refer to Section 3: Retrieval Algorithms of the ATBD for this product (Kim et al. 2015). Anthropogenic Radio Frequency Interference (RFI), principally from ground-based surveillance radars, can contaminate both radar and radiometer measurements at L-band. Early measurements and results from ESA's Soil Moisture and Ocean Salinity (SMOS) mission indicate that in some regions RFI is present and detectable. The SMAP radar and radiometer electronics and algorithms include design features to mitigate the effects of RFI. The SMAP radar utilizes selective filters and an adjustable carrier frequency to tune to predetermined RFI-free portions of the spectrum while on orbit. More information about error sources is provided in Section 3.5: Error Budget of the ATBD. Each HDF5 file contains metadata with Quality Assessment (QA) metadata flags that are set by the Science Data Processing System (SDS) at the JPL prior to delivery to the National Snow and Ice Data Center Distributed Active Archive Center (NSIDC DAAC). A separate metadata file with an .xml file extension is also delivered to NSIDC DAAC with the HDF5 file; it contains the same information as the HDF5 file-level metadata. Note: As SPL2SMA is a research product, the accuracy requirements are tentative and are set to 0.06 cm3/cm3 for soil moisture and up to 5 kg/m2 for vegetation water content (VWC). Quality Control (QC) is an integral part of the SPL2SMA processing. The QC steps of the SPL2SMA processing are based on the flags that are provided with the input data stream (SPL1CS0), different types of masks, flags, and fractional coverage of other variables provided by ancillary data. The soil moisture retrieval flags are listed in Table 3. The SPL2SMA product also uses the radar backscatter and RFI flag from the SPL1CS0 product. The freeze/thaw flag for SPL2SMA is generated from modeled surface temperature information called TSURF from the Global Modeling and Assimilation Office (GMAO). The GMAO-modeled TSURF parameter is used due to the maturity of the SMAP radar freeze/thaw algorithm and availability of radar measurements. The SPL2SMA water body flag is generated from a priori information on permanent open freshwater from the Moderate Resolution Imaging Spectroradiometer (MODIS) MOD44W database. The MOD44W database is used due to the maturity of the SMAP radar open-water algorithm and availability of radar measurements. The SPL2SMA product also has a nadir region degradation where the effective resolution in the cross-track direction gradually becomes 36 km. The flag, called the 3 km nadir region flag, is assigned to identify this region. For a detailed description of the SMAP instrument, visit the SMAP Instrument page at the JPL SMAP Web site. Jackson, T. J., H. McNairn, M. A. Weltz, B. Brisco, and R. Brown. 1997. First Order Surface Roughness Correction of Active Microwave Observations for Estimating Soil Moisture.IEEE Trans. Geosci. Remo te Sens. 35:1065-1069. Kim, S. B., J. Oullette, J. J. van Zyl, and J. T. Johnson. 2015 (In revision). Dual-Copolarized Approach to Detect Surface Water Extent Using L-Band Radar. IEEE Trans. Geosci. Remote Sens. Kim, S. B., M. Moghaddam, L. Tsang, M. Burgin, X. Xu, and E. G. Njoku. 2014. Models of L-band radar backscattering coefficients over the global terrain for soil moisture retrieval.IEEE Trans. Geosci. Remote Sens., vol. 52, pp. 1381-1396, 2014. Kim, S. B., L. Tsang, J. T. Johnson, S. Huang, J. J. van Zyl, and E. G. Njoku. 2012. Soil moisture retrieval using time-series radar observations over bare surfaces. IEEE Trans. Geosci. Remote Sens., 50:1853-1863. Kim, Y., and J. J. van Zyl. 2009. A Time-Series Approach to Estimate Soil Moisture Using Polarimetric Radar Data. IEEE Trans. Geosci. Remote Sens. 47:2519-2527. Kim, Y., and J. J. van Zyl. 2000. On the Relationship Between Polarimetric Parameters. IEEE Geoscience and Remote Sensing Symposium. Hawaii, USA.